After several months of tests, the Emergesat humanitarian relief container recently departed for Chad on its 1st mission to establish high-data-rate communications links and handle logistics. 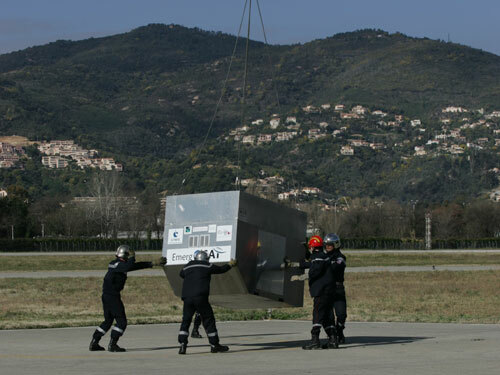 Developed by Thales Alenia Space for the French humanitarian foundation Casques Rouges, with applications, engineering and promotional support from CNES, the compact Emergesat container is easily transportable and quickly deployed in the event of a humanitarian crisis. Once up and running, Emergesat provides first responders with a palette of tools to aid relief efforts. Running off its own electrical power supply, it enables field teams to set up high-data-rate satellite communications links and local radio networks anywhere using WiFi or VHF systems. The container also provides mapping, resource management and civil engineering software tools. “Emergesat’s key features are speed of deployment, ease of use and a multi-function capability,” says Antonio Güell, Head of Applications/Exploitation at CNES. Mid-November, an Emergesat container departed for Abéché in eastern Chad, where 12,000 to 13,000 humanitarian aid workers are engaged in efforts to assist the hundreds of thousands of refugees from Darfur. Deployed by Casques Rouges, Emergesat is being made available to the United Nations High Commission for Refugees for a renewable period of 3 months. High-data-rate satellite links will support communications over long distances, enabling field teams to exchange data in real time, access databases or set up medical teleconsultations. Emergesat is a complete humanitarian kit packed with new technologies that should help restore a positive and professional image for French humanitarian aid teams tarnished by recent events in the region. The Casques Rouges foundation has a second Emergesat system ready for deployment to a natural disaster or health crisis area. Another container specifically designed to support emergency telemedicine in French Guiana and the French West Indies is currently under construction.